"The treatment has been life-changing"
Dental implants are a strong, permanent and very realistic way to replace one or more missing teeth. Not surprisingly, they are becoming extremely popular with patients. 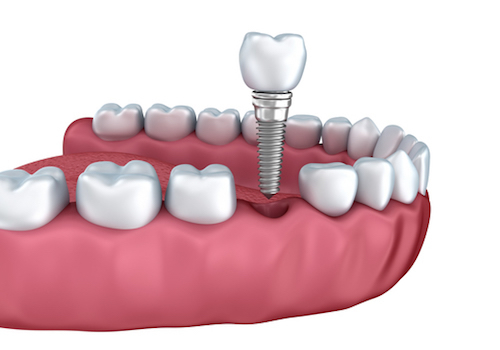 A dental implant is a tiny titanium post which is gently placed into your jaw bone. Over time, the bone and the titanium bond together, forming a permanent artificial tooth root. We can then use this artifical root to support a crown, bridges, or even dentures, giving you a full, natural-looking smile and enabling you to eat and speak with confidence. Implants work largely because of the body’s amazing natural ability to heal itself, together with the rare compatability of the titanium metal that is used for the implants. We have a great deal of expertise in both simple and complex dental implant procedures. 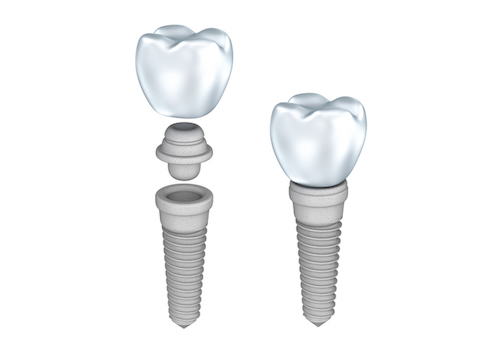 There is a lot of expertise and knowledge which goes into the placing of the implants. We have to choose which implants would work best with your unique needs. We have to ensure that they are positioned in exactly the right place and at the correct angle. When multiple implants are required we use guided implant surgery. This utilises the latest digital 3D CT Scanning technology which ensures that implants are placed with sub-millimetre pinpoint accuracy. This is very important to ensure that you get the best results without any potential problems. Once we have placed the implant, we leave nature to run its course. Over a period of approximately 3-6 months, your bone will gradually bond with the titanium, knitting itself around the implant to form a strong, permanent bond. Once this process is complete, we can then fit a crown or bridge on the implant(s), or use them to hold dentures firmly in place. In some cases we can use a unique Same Day Teeth procedure where your dental implants and bridge can be fitted in the same day. At Cape Road Dental Practice we are proud to be a Same Day Teeth centre of excellence. The end result is teeth that do what they are supposed to do – look good, feel good, and function well so you can eat, laugh and speak with complete confidence. What will my implant treatment involve? Implant surgery is surprisingly easy from the patient’s perspective, and on the whole completely painless. The first stage is a thorough examination and evaluation with us. This will enable us to ensure that you are suitable for implant treatment. Once our evaluation is complete, we will discuss your treatment options with you so you can make an informed decision. We will provide you with a written treatment plan and a breakdown of costs. Some patients may need to undergo treatment to improve the health of their gums, or to increase the amount of bone in the implant site (bone grafting). Once this is succesfully completed, the implant can be placed. The actual implant placement surgery is usually quite quick and takes around 15-30 minutes. If you are particularly nervous about the procedure, we can offer you sedation to help you relax. Once your implants have successfully bonded with your jawbone, we will need to take another impression (mould) of your mouth. This will be sent to our dental laboratory, where your crown, bridge or denture will be carefully crafted to provide a perfect fit and colour match. This usually takes about two weeks. 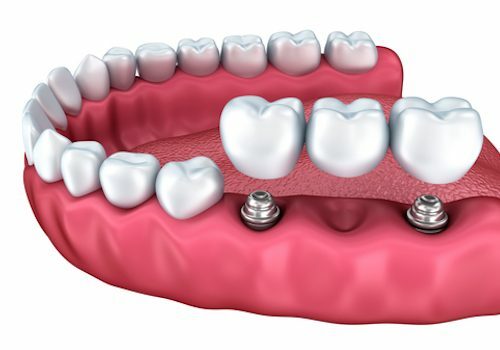 If you are having a crown or bridge, these will be permanently fitted to your implant – they are not removable. Similarly, our implant-borne teeth are screwed into place, and are not removable. Implant-supported dentures, on the other hand, are removable for easy cleaning – we will show you how to do this. Once your treatment is finished, you will need to continue to take good care of your implants and the surrounding gum by following a good oral health routine. We will advise you on how best to do this. For more information on dental implants, call our practice in Warwick on 01926 491029 or book a consultation.